Identification: This elongate aeolid appears almost hairy due to the varying length and random arrangement of its cerata. The body is translucent-cream with branches of the digestive gland visible through the notum and cerata as dark bands. Depending on the food source, the bands may range from gold to brown to deep blue. Unique to this species is an undulating membrane along the posterior edge of each ceras. The head is rounded and the rhinophores and cephalic tentacles are smooth and tapered. 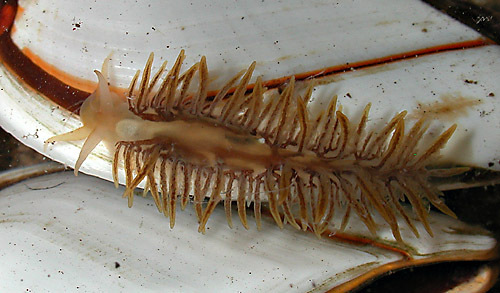 Natural history: Fiona pinnata is commonly found on floating debris (such as wood, plastic and glass balls) to which gooseneck barnacles of the genus Lepas are attached. They cling tenaciously to their floating substrate and feed on the barnacles which they eat by penetrating the stalk and consuming the inner tissue. They also inhabit and feed on the chondrophore Velella vallela, consuming both the float and polyps. However, they do not store the nematocysts. Holleman (1972) reported a remarkably short life cycle for this species--maturing, mating and laying eggs within a month. This is advantageous when a food resource is often small or isolated, as is the case with barnacles growing on floating objects. By the time the food is exhausted, the nudibranchs have already reproduced and their larvae are "seeking" new prey. Their egg masses can often be seen attached to the floating debris near the animals. They are tightly coiled, white to cream, barrel-shaped spirals of about 1-1.5 whorls with a diameter and height of up to 3 mm. The masses are anchored by short stalks of hardened mucus and may swell noticeably and become a darker cream as the eggs develop. A mass laid in a dish hatched in about three days. Distribution: Maui, Oahu, Kauai and French Frigate Shoals: cosmopolitan. Taxonomic notes: The family Fionidae was formerly used only for this species. The name means feathered. Photo: CP: 20 mm; found on a beached laundry basket covered with Lepas spp: Hekili Point, Maui; April 6, 2004.